Laying in bed at my hotel after a long day doing touristy things in Yangon, the hotel started to sway. At first, the movement of the building was slight and one could have easily not noticed if walking around, but the building started rocked back and forth with more intent. The quake wasn’t violent by any means, but it was the unmistakably an earthquake. Once the building stopped swaying, the television, lights and air conditioner cut out and you could see the lights coming through the window go black as the earthquake rocked the city’s electricity grid and infrastructure. Looking out the window, the city was completely black for a good 15-20 seconds before those with backup generators (not many) and more recently-built buildings lights started to flicker back on. My hotel, the RGN City Lodge opened in mid-2015, so the electricity for the building was one of the first to come back on. 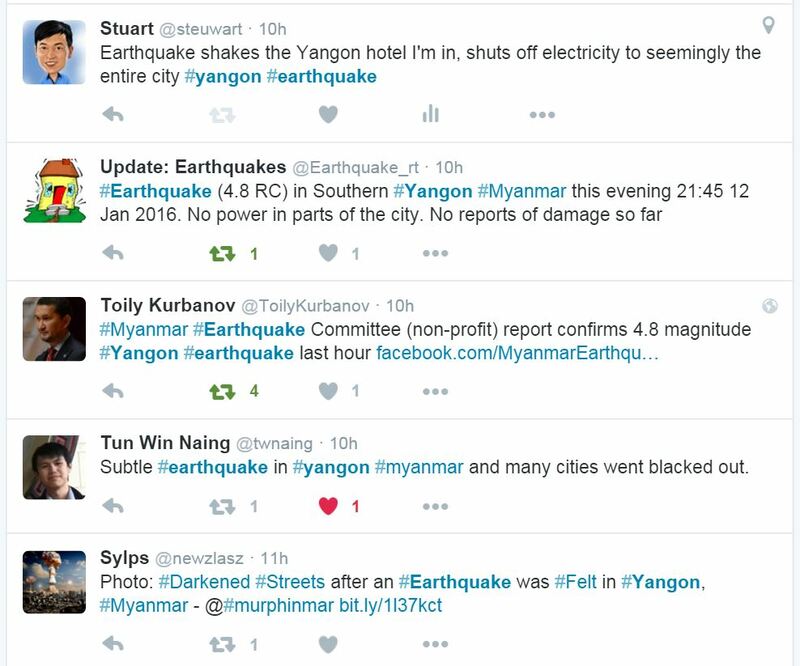 As soon as the power came on and the internet was restored, I searched #Yangon and #earthquake on Twitter to see if there was an earthquake or not (the front desk indicated that it was a transformer not an earthquake, but it was very likely a language barrier in trying to communicate what really happened). Turns out that my experience with earthquakes in San Francisco served me well. 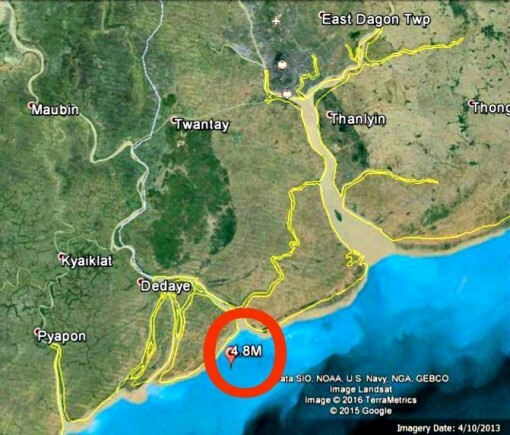 The Myanmar Earthquake Committee reported a 4.8 on the Richter Scale with the epicenter at the Lat Khoke Kone Shore, Yangon Region, near Kwan Chan Kone. The minor earthquake occurred approximately at 9:30 PM local time on January 12, 2016. * Twitter is great for localized events like this, especially where the events aren’t considered “newsworthy” or in areas that are slow to report (like Myanmar).